Some of the jobs might ask the applicants for reference letter when they would apply for a certain job. 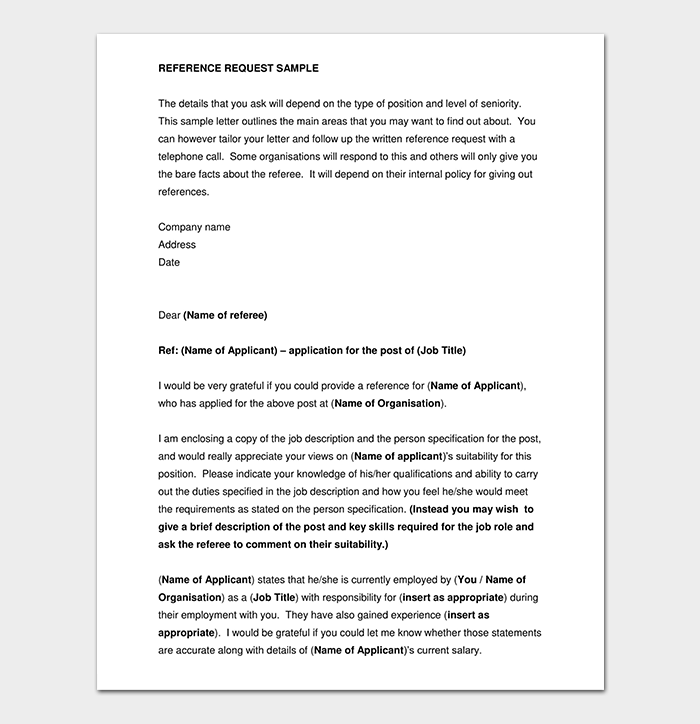 It would be thus, important to provide the Reference Request Letter to complete the process of a job application. 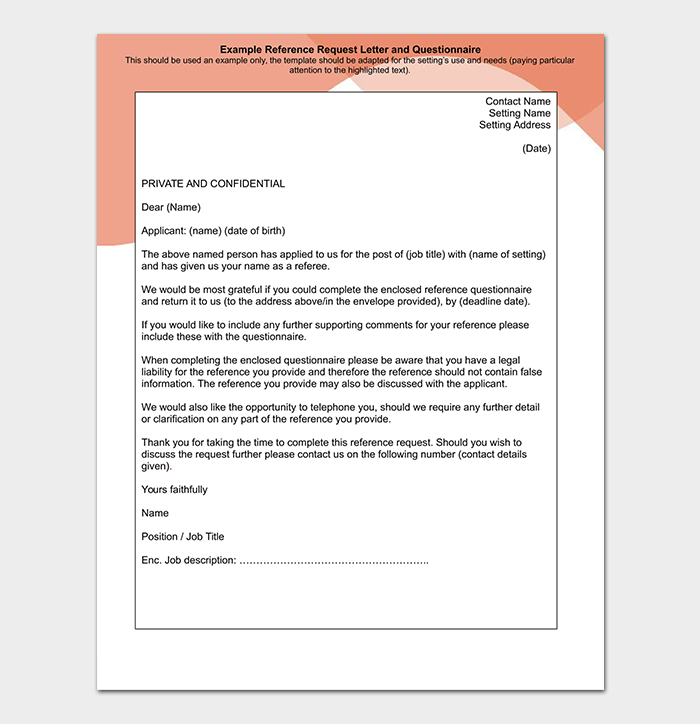 A user may find it difficult to find the right content for reference request letter and thus using a guide would make it easier to find the relevant content. It is important to keep in mind that a letter would highlight the skills, abilities, and qualifications of a person through his/her writing style. 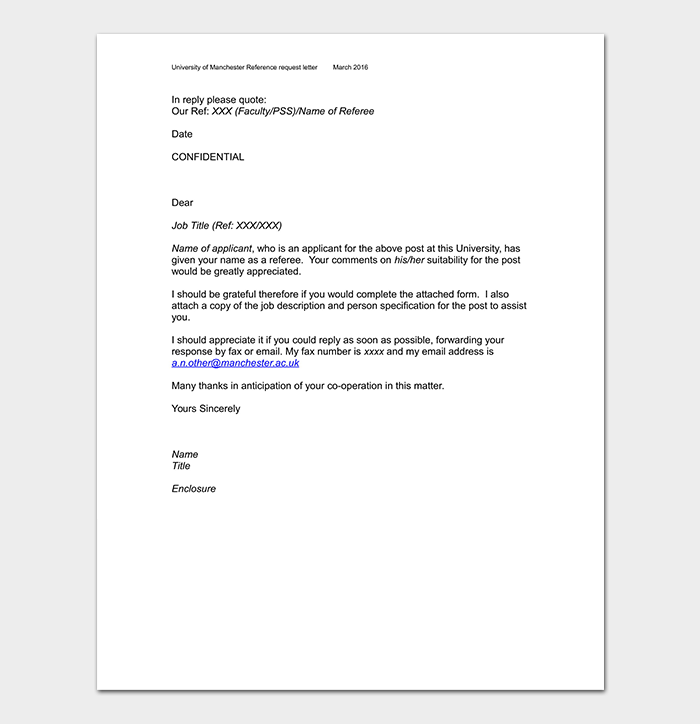 I am writing this letter as a request for you to provide a reference for me. As you are aware that I have worked as a Sales Manager for you between (Date to Date), during which time I was awarded the employee of the year award. I would highly appreciate if you state my skills, abilities, and performance during my tenure with ABC Company in the reference request letter. 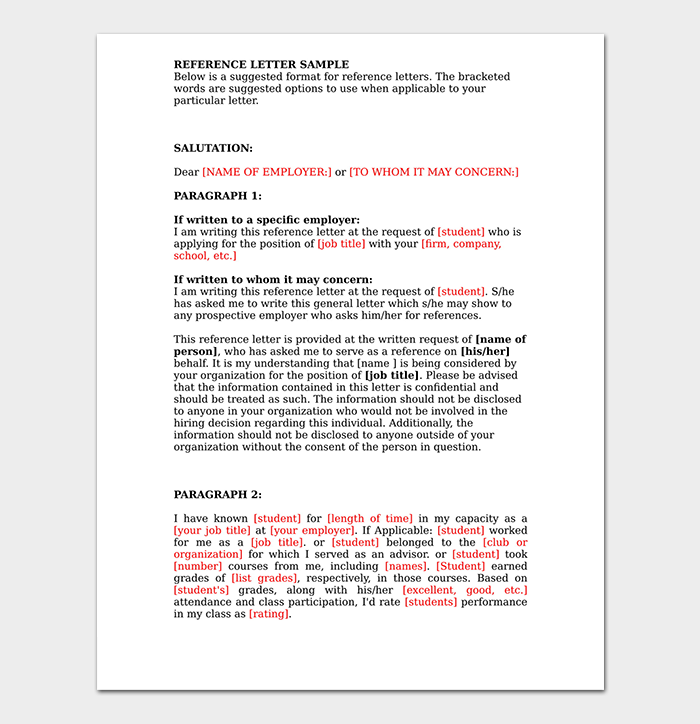 I am seeking new employment opportunities and a reference letter from you would be highly appreciated. I need to have the list of references ready by Date. 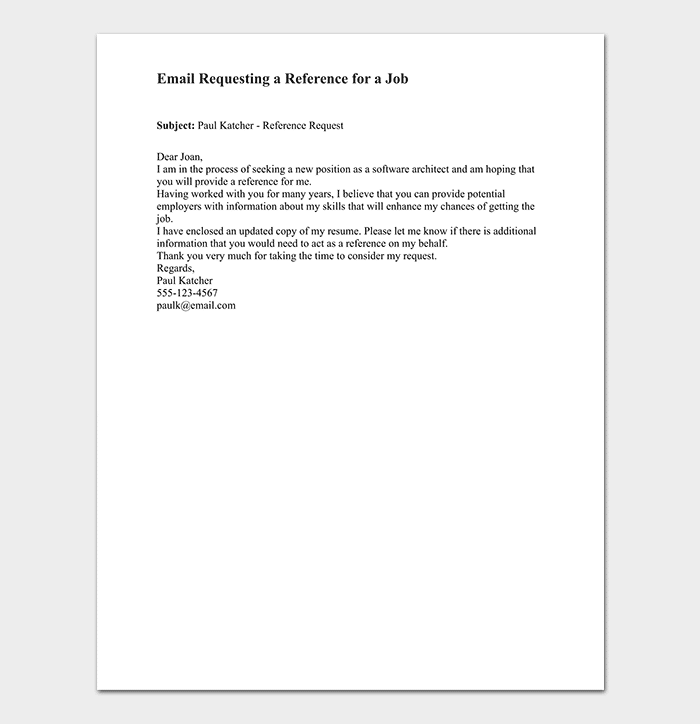 An individual might write an email to the former employer or a referee requesting a reference for a certain position. It is important to write the email in a professional tone. Remind the person of skills and abilities and ask them whether they would be able to provide contact information for the job. 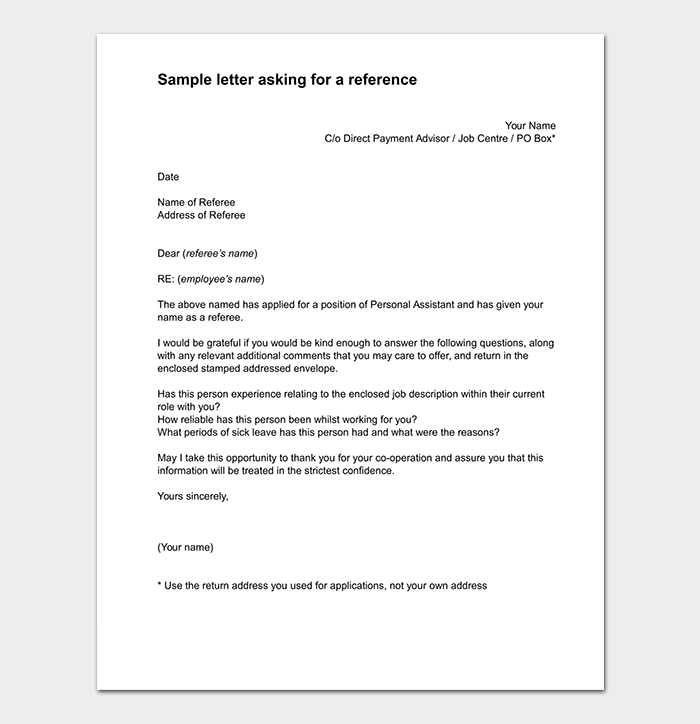 A bank reference letter is usually with the bank that an individual has an account with and this letter would focus on the person’s ability to maintain a good relationship with the bank. 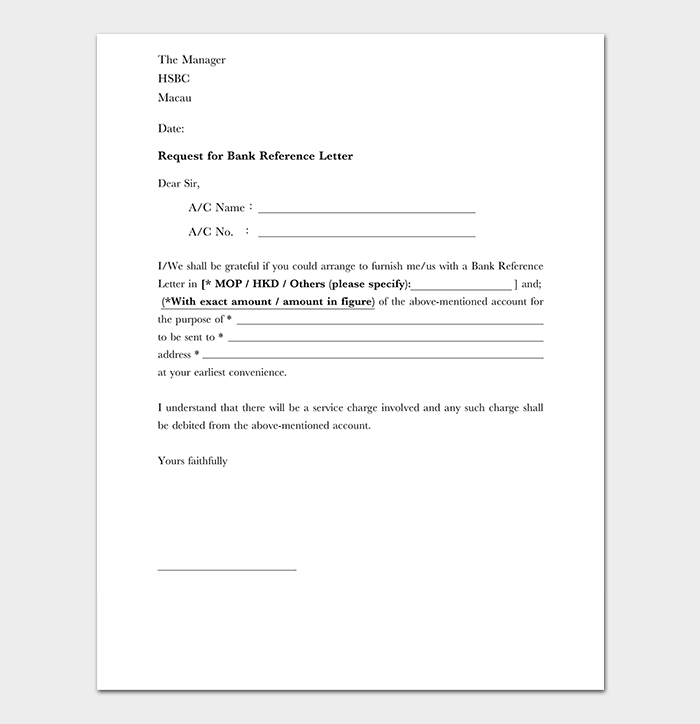 A bank reference letter would show the number of years a person has a relationship with the bank. 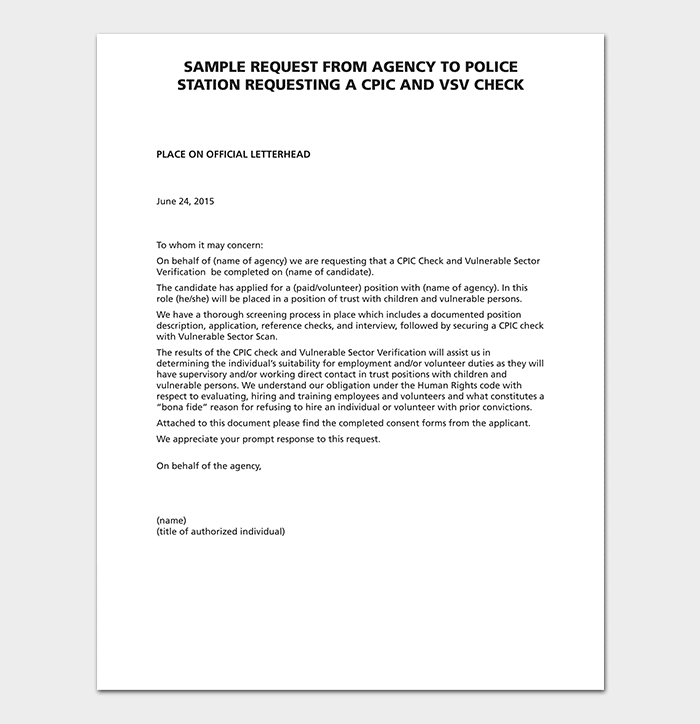 Hence, a request for bank reference letter would be quite favorable in highlighting a positive image of the person. 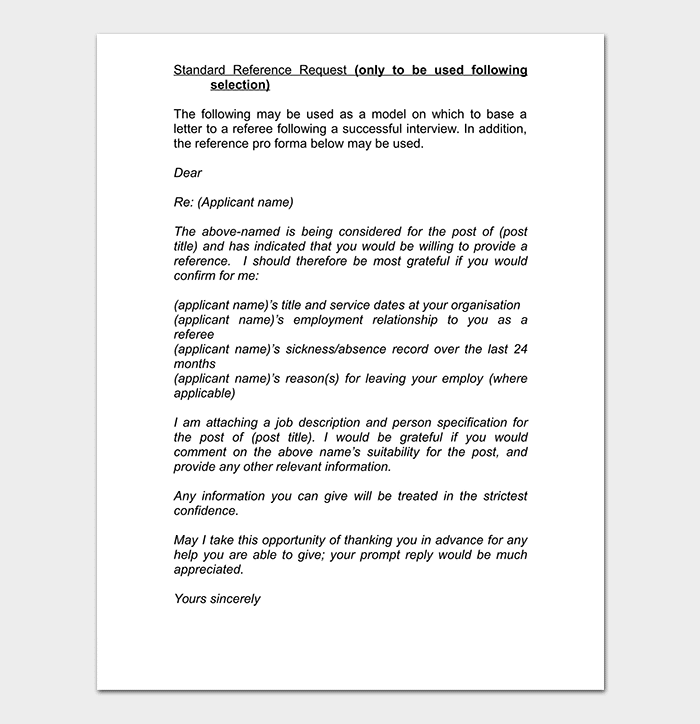 Writing a reference request letter for the employer can be quite useful for a person who is seeking employment at a suitable job. 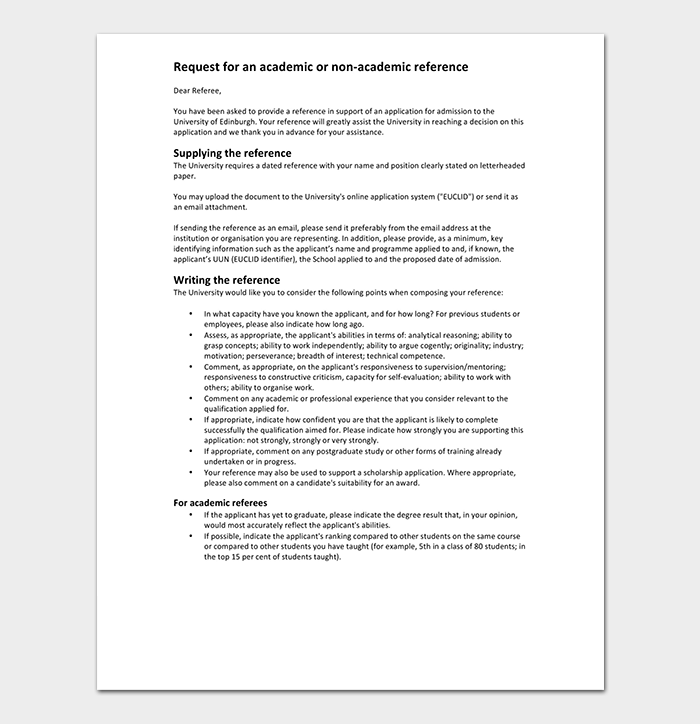 Is, therefore, important to know the content, which should be a part of this kind of letter when writing the reference request letter for an employer. An individual who is dealing with a new supplier, a utility provider, or a lender needs to show that he or she had been regular in paying their bills on time in the past. 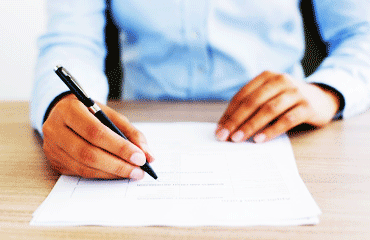 Hence, a credit reference letter from the previous business or lender can be of great help. 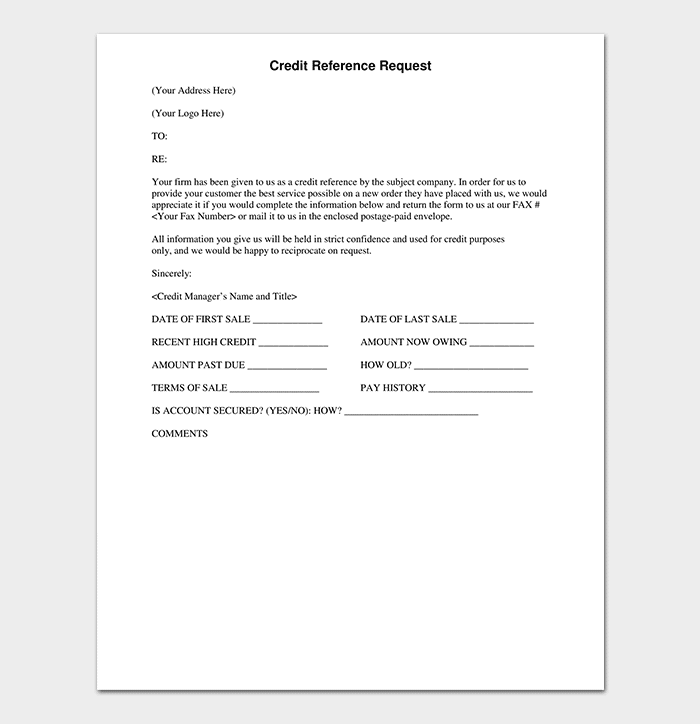 It is, therefore, important to know the content for credit reference request letter, which can guide in writing the most suitable content for such a letter. Ask for Permission: First, ask the former employer if they would be able to provide a reference for you. 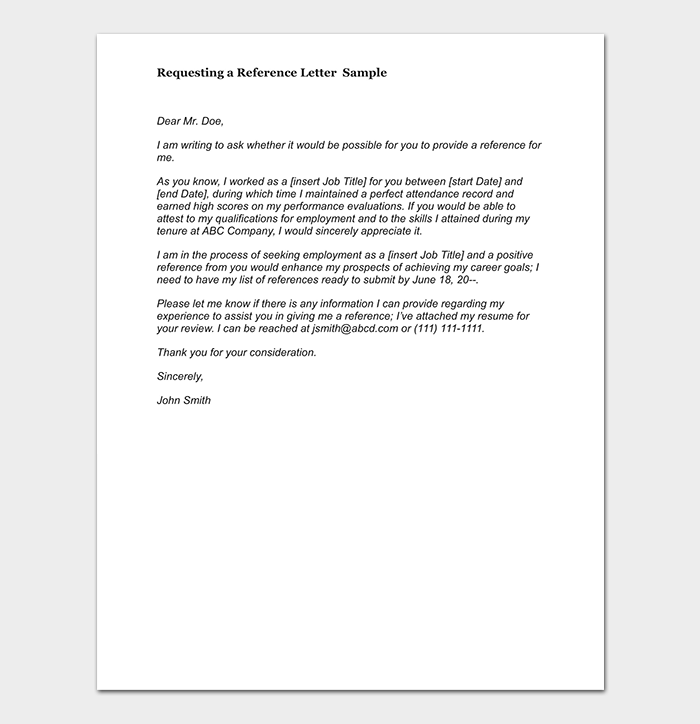 It is important that a former employer is comfortable in giving a reference letter in your favor. Let the Employer Know: It is important to let the employer know in advance that you are going to use their reference and update the employer about your career plan. Skills and Abilities: Remind the employer about your skills and abilities. Contact Information: Request the former employer if they would be willing to share their contact information with the new employer.